The company promises to 'overdeliver' on the gameday experience by awarding free pizza for a year to the parents of the first baby born after kickoff on Super Bowl Sunday. For some people, the Super Bowl won't be the biggest thing happening Sunday. Some parents will be busy becoming new parents at hospitals around the country. For these parents, Pizza Hut has a special offer. In addition to the pizza, those parents will also get tickets to Super Bowl LIV at Hard Rock Stadium in Miami. 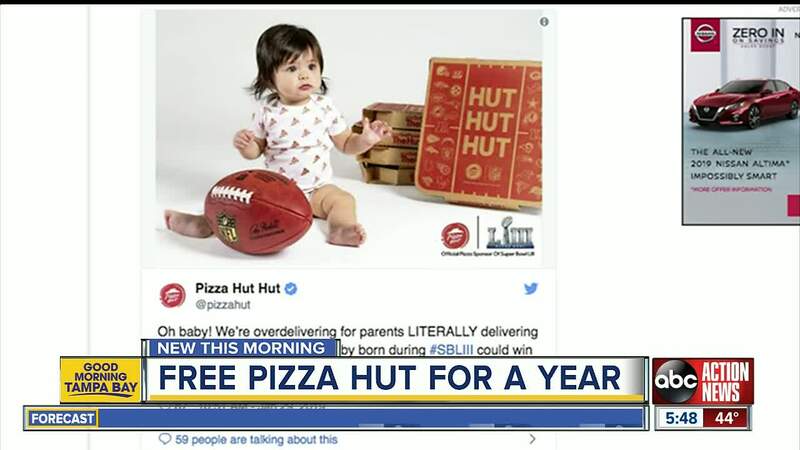 To enter, parents with a baby born during the game need to post a photo on Twitter of their newest arrival (including exact time of birth) and tag @PizzaHut in the post. Use the hashtags #PizzaHutSpecialDelivery and #promotion to be included in the contest. For additional info and terms and conditions, click here . Even if their baby isn't the first born after Super Bowl kickoff, Pizza Hut will make free pizza deliveries to local hospitals in the Boston and Los Angeles areas for fans who may be missing the big game. The Rams and Patriots square off in Super Bowl LIII at 6:30 p.m. Sunday in Atlanta.